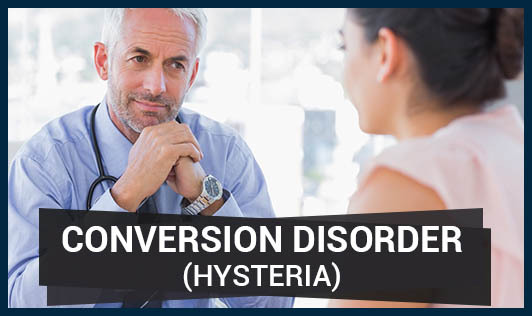 Conversion disorder, formerly known as Hysteria, refers to a health problem that starts as a mental or emotional crisis- a stressful incident of some kind that converts to a physical problem. For instance, a person's leg may become paralyzed after a fall from a horse, even though he wasn't physically injured. The exact cause of this disorder in unknown, but doctors suggest that that the part of the brain that controls one's muscles and senses may be involved. The physical symptoms that an individual experiences are thought to be an attempt to resolve the conflict that he or she feels inside. People who have this disorder are not intentionally making up their symptoms. • Trouble swallowing or "a lump in the throat"
Treatment for this disorder may include counselling and medication. Consider practising stress reliving activities such as yoga and meditation as these may help to reduce reactions to the events that cause symptoms of conversion disorder. Please seek medical attention if you notice symptoms of conversion disorder!